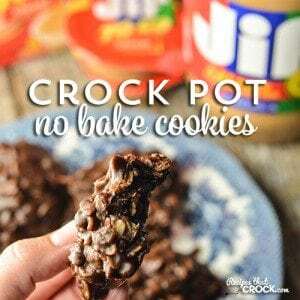 Crock Pot No Bake Cookies - Recipes That Crock! Are you looking for a fool-proof no bake cookie recipe but you are tired of standing at the stove stirring the pot? 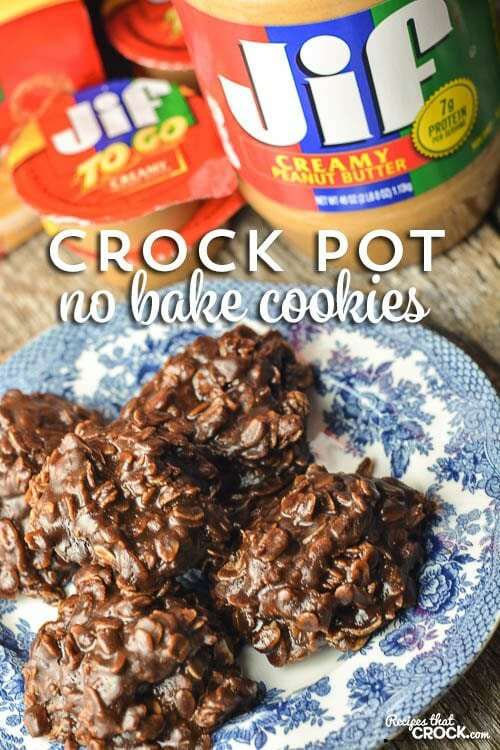 Our Crock Pot No Bake Cookies are also stir free! Throw the ingredients in as directed, and let your slow cooker do the prep! Then scoop out your cookies like usual and you have the perfect on-the-go sweet treat all summer long! NOTE: I am being compensated by Jif for your participation in this campaign, but as always opinions and thoughts are all my own. I am part of the Mom It Forward Blogger Network. Truth be told, when Jif contacted me about their Jif To-Go products and campaign, I was so excited to be a part of it! 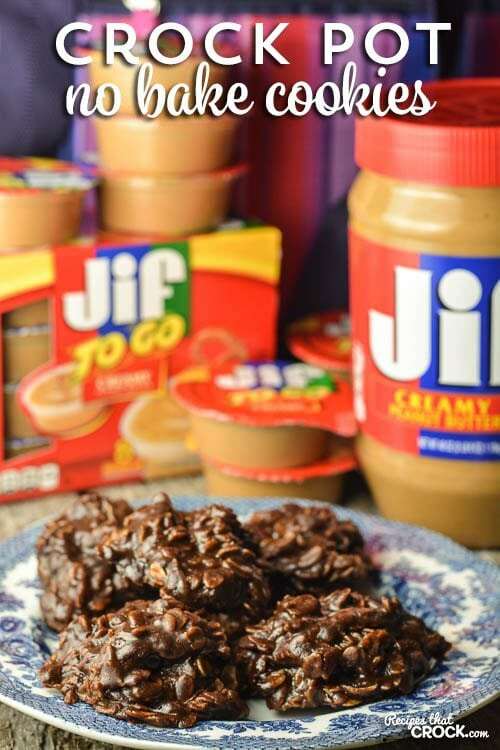 Jif has been a family favorite since I was a kid, and it is the key ingredient to many of our tried and true family recipes including THE peanut butter cookies I am known for in my family. So when I got the craving for a great no bake cookie the other day, and I didn’t want to stand at the stove on a hot summer day, I naturally turned to my slow cooker (and my trusty Jif) and set out to make a version that could skip the stove. Now, making no-bakes in the slow cooker MAY sound easy… but starting out, I hit some hurdles. The first recipe I tried, turned out great appearance and taste-wise but had an off texture, so I went back to the drawing board. My second attempt produced a great texture and taste but melted too easily in your hands. Third time was the charm! Great consistency, texture and even an improvement on taste. Mommy score! These cookies are just perfect to throw in a cooler bag along with your Jif To Go cups, pretzels and celery for all your snacking needs sweet and savory–while out and about this summer. We love the Jif To Go cups for a great snack that is both satisfying and filling and the cookies make for a great sweet treat! 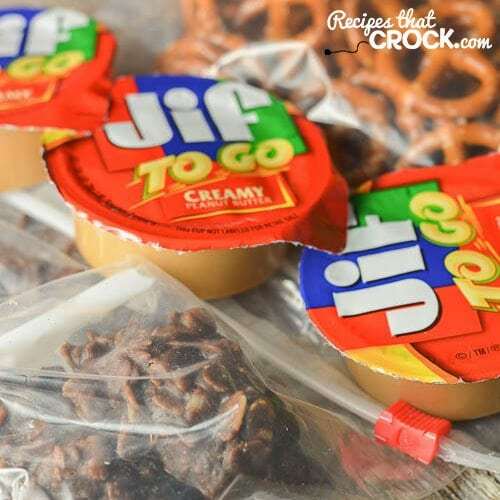 When it comes to convenient snacks for life on the go, Jif has got you (and me) covered! Have you seen those all-in-one portable snacks of Creamy Peanut Butter with Pretzels or Chocolate Silk Peanut Butter Spread with Pretzels with Jif To Go Dippers? Must. Try. Soon. 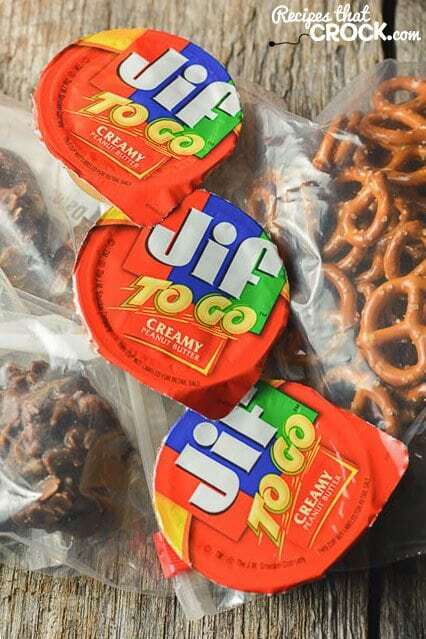 From summer camp to summer travels, Jif To Go Dippers are a go-to for a simple and delicious solution for every snacking occasion. The individually sized 1.5oz Jif To Go cups (a family favorite around here!) are great for dipping all of your favorite fruits and vegetables, anytime, anywhere. Available in convenient 3 or 8 count packages, Jif To Go is a great snack to keep you moving throughout the day! In a mixing bowl, combine sugar, powdered sugar, cocoa and then add butter and milk. Mix until fully combined. It should be a little thinner consistency than brownie batter. Pour the mixture into a 4 qt slow cooker (if using a larger slow cooker, cooking times may reduce significantly). Pour oats on top of mixture- DO NOT MIX. Place Jif Peanut Butter in the middle on top of the oats- DO NOT MIX. Place the lid on your slow cooker and cook on high for 1 hour 15 minutes or until the cocoa mixture reaches a rolling boil. Stir well and use a cookie scoop to place two dozen cookies on lined cookie sheets. Allow cookies to set for a few hours and then store in a sealed container. We used our 4 qt slow cooker for this recipe. If you choose to use a larger slow cooker, please note that your cooking time might be reduced significantly.